Littleton Conservation Trust Trustee Rick Findlay is recruiting a volunteer work group to control the spread of invasive plant species. Our current top priority is stopping the spread of Garlic Mustard, one of the most destructive invasive plant species in the state. 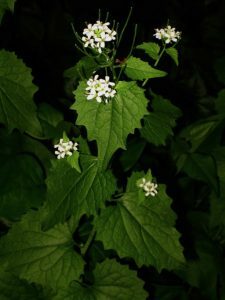 Introduced from Europe, garlic mustard is self-fertile and is very difficult to eradicate once it is established in an area. It spreads rapidly and, unfortunately, displaces native or other desired plants in a relatively short period of time. Each plant can produce thousands of seeds which spread by wildlife, humans, water, or other means. Most Garlic Mustard infestations can be removed by simply pulling the shallow rooted plant out of the ground and placing it in trash bags for disposal. We invite volunteers of all ages to participate in this project. Our ultimate goal is to map infested areas and get volunteers to adopt specific roads or areas. It will be a multi-year effort until existing seed is no longer viable. Please help us to establish invasive plant awareness throughout the Town. Tell your friends and neighbors about this project! With your HELP, we can defeat this menace.